Following is a video of gigantic bubbles in slow motion, at the Sands Point Preserve. Following is a video of the 2018 Sands Point Preserve Village Day, where hundreds of screaming kids tried to pop gigantic bubbles for 4 hours non-stop. You don’t have the patience to internalize principles of the fine art of big bubble making. You just want to make some bubble juice, go out and have some fun. The easiest way for you to get what you want is to buy David Stein’s Big Bubble Mix. Just add hot water and dish soap. You can buy it on Amazon. It is really the only commercial bubble (power) mix available. 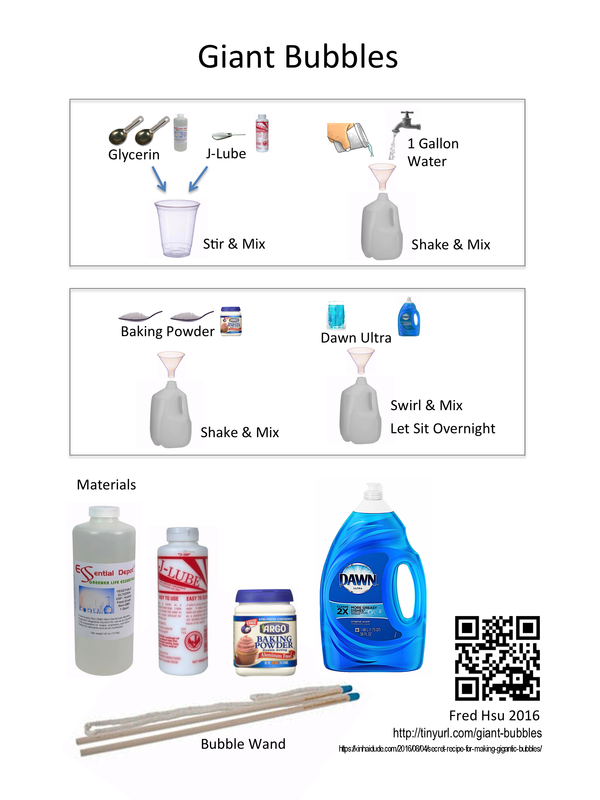 It is many times more economical to buy the mix and dish soap yourself, than to buy ready-made liquid bubble solutions. If this works for you, you can stop reading and go make big bubbles. Ah, you are still with me. So you still want to make your own bubble mix and juice. But you can’t be bothered to understand the science behind it. You just want me to tell you exactly what ingredients to buy and how to mix them. Sure. The first thing you should know is that all these great recipes require that the prepared solution sit in a container for 24 hours for best results. So I am sorry to break it to you – you probably can’t just mix it now, and go out to blow bubbles right away with great success. In any case, you still need to buy bubble wands. I hope you found this blog at least a day before your outdoor party. That said, if you want to use your juice right away, it will still work, just not at optimal strength. The second thing is, this recipe is only my layman’s best attempt at making bubble juice. I’ll update the recipe as I refine it… if I do. But it is probably already better than 90% of recipes you find out there in the interwebs. Most of them are just outright wrong anyway. Some are posted by people who have no clue. Others are posted by professional bubbleologists or makers of commercial bubble solutions. The latter have no interest in telling the general public the one key ingredient in their bubble juice. They’ll, however, be happy to provide a menu of mediocre recipes as alternatives for the plebeians, so poor plebeians can ooh and aah at the professional stuff in comparison. The third thing is, weather affects bubble-making greatly. In general you want to blow big bubbles in cool weather with very high humidity – it’ll be easier to generate big bubbles and close them without bursting them. If you don’t know what I mean by “closing them”, just go out and try to make big bubbles. You’ll then get what I mean. Also, a little bit, but not too much, wind will generally help bubbles stay afloat. I’ve made huge bubbles that float for what felt like minutes. Before you make the juice, however, order this bubble wand online. You can find the Beeboo® Big Bubble Pro Wand for about $17. Of a few big bubble-making tools that kids and I have tried, this one is the absolute favorite of everyone. You can buy and try many different tools in order not to miss out on the best tool, if you are like me. But I can already tell you that everyone in the party will be fighting for this wand once they slowly but surely get better at making big bubbles. The first ingredient you buy is the most important one that professionals try not to let you in on. You can read on past this section to find out why a polymer is important for big bubble solutions. When you look at this product on Amazon, you’ll find that “Customers who bought this also bought”… drum roll, please… Dawn dishwashing liquid, bubble wands, stainless steel speculum, silicone nozzle enema attachment, and adult toys. J-Lube is apparently useful to three different communities: big bubble fanatics, veterinarians and a third group. This third groups is why most bubbleologists hesitate to tell enthusiastic parents about this ingredient, in front of their kids. You can get a bottle of this powder for $18, and it is good for making some 100 gallons of bubble juice. Unless you are a real bubble fanatic, a bottle will probably last you your lifetime. The second ingredient is optional. Most online recipes calls for glycerin as “the” key ingredient. This is not really true, unless you are ready to lavish order of magnitude higher proportion of this expensive ingredient. And even then it is not clear you’ll get even close to what half a teaspoon of J-Lube can achieve. I use glycerin to mix J-Lube which would otherwise clump if dumped directly into water. You can also use light corn syrup instead. Some people report success mixing J-Lube with detergent first. But I don’t want to stir up tiny bubbles when mixing. Thus glycerin. One quart of this glycerin sets you back $11, and is good for making some 43 gallons of bubble juice. Then you need baking powder. Note “powder”, not “soda”. This is used to control the pH level of the solution for stability. Mix the above glycerin + J-Lube goo with warm water. Then you need to dump baking powder into the solution and stir it quickly. You don’t want the CO2 to simply fizzle away. The 12 oz powder costs $6, and is good for roughly 12 gallons of bubble juice. 1. Measure 1 teaspoon of J-Lube. Mix it with 2 tablespoons of glycerin in a plastic cup. Stir the solution into a uniform goo using a coffee stirrer. Or if you are Chinese, use a chopstick. 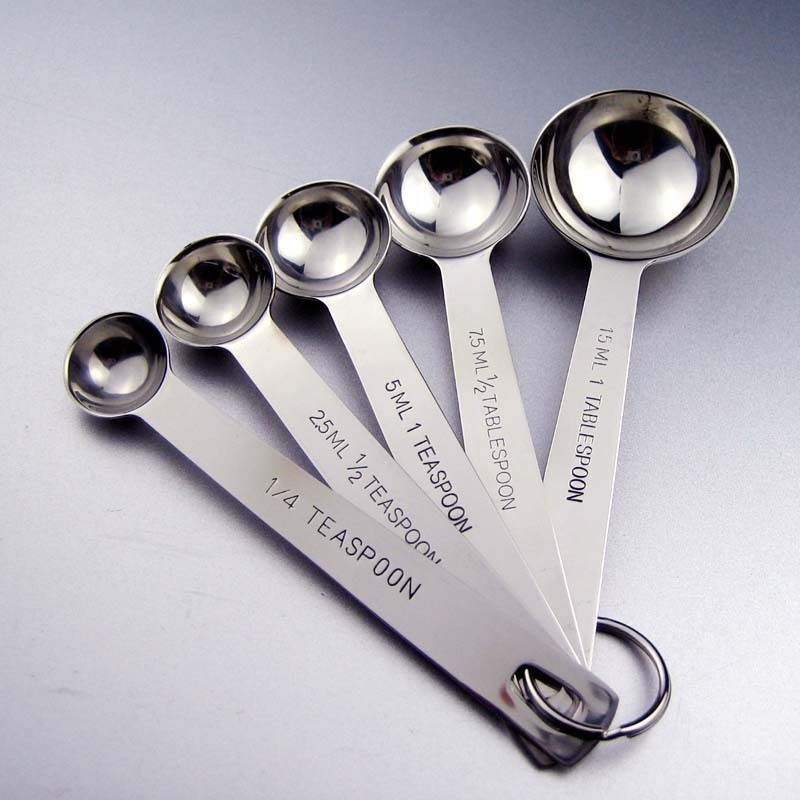 If you can’t tell a teaspoon from a tablespoon, refer to the image of various spoon sizes. 2. A plastic mixing container would be useful for the next step. So is a plastic funnel. If you don’t know what these things are, maybe watch Breaking Bad first. Pour some hot water from the faucet into the container. Use distilled water if you can, else soft tap water. Hard water is not good for bubble making. Then pour in the goo from step 1 into the container through the funnel, as you stir the solution in the container with a chopstick or a stirrer. Pour more hot water through the funnel to rinse goo into the container. 3. 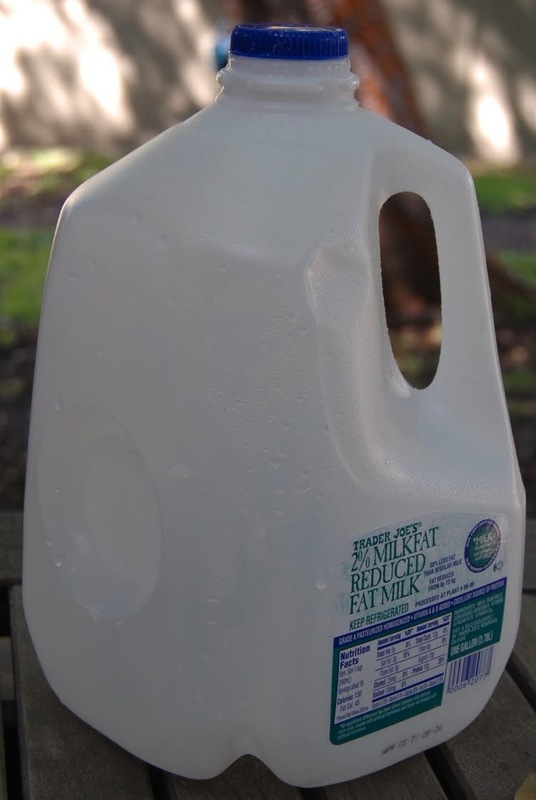 Get a one-gallon milk jug. Fill a quarter of it with hot water. Pour the solution from the mixing container into it through the funnel as you swirl the content of the jug. Then add more hot water to about 4/5 capacity. Measure 2 tablespoons of baking powder, and pour it into the jug. Close the jug lid, and gently swirl it to dissolve the powder. Let some CO2 vent out of the jug by peeling the lid away gently. 4. 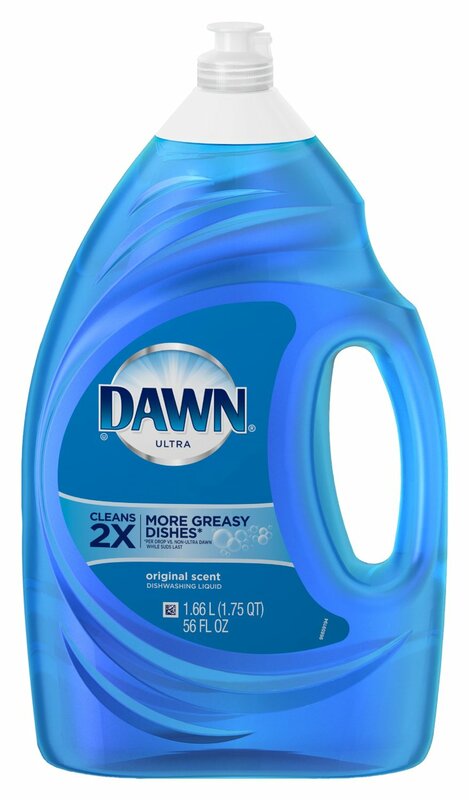 Measure 8 FL oz of Blue Dawn Ultra (about 1 cup, or 1/16 gallon), and pour it via the funnel into the jug as you swirl it gently. Try not to make a lot of small bubbles. Fill up the jug with more hot water to get to one gallon. 5. Leave the jug without the lid for half an hour to let most bubbles burst away. Then close the lid. Let the solution sit overnight for best results. Updated 2016-10-08: originally I used 12 FL oz of detergent which yielded a water-to-detergent ratio of 10:1. I’ve since experimented with lighter solutions of 16:1 and 20:1. Honestly I couldn’t tell these solutions apart. They appeared to yield the same colors. So I now just go with exactly one cup of detergent (a ratio of 16:1). Here is a convenient PDF flier you can download and print out for events. Click on the PDF thumbnail. If you want to include the flier as a picture for social medium you can use the PNG image instead. I made the flier for a local fall festival I was invited to. Hundreds kid got a kick of out popping these big bubbles. There are useful resources online. You should check them out. You’ll learn the basic principles of big bubble making from these places. Wayne Schmidt’s Monster Soap Bubbles. Just look at the picture. The guy went through a meticulous series of experiments to find the best bubble juice recipe of his own, and wove his own rope. I am not using his recipe yet, as I found this blog after my own simple experimentation. He lives in a desert. Not every recipe works for everyone’s environment and particular brands of detergents. He also uses Surgilube which I wasn’t aware of until reading that blog. As a true fanatic, he naturally insists that an electric mixer be used to mix stuff. His best formula is described at the very end of the article. He actually uses a 20:1 ratio of water to detergent. It’s not clear whether he used the Ultra version though. The Soap Bubble Wiki was started by some bubble fanatics. You will find a lot of useful information here. This is where I found out about various polymers such as J-Lube, and how a polymer contributes to a great bubble juice. In fact, Wayne Schmidt relied on basic information from this wiki to kick-start his own experimentation. But this website slows down your web browser and grinds your computer to a halt. I don’t know what ads or scripts they run on that site. It’s pretty annoying. But I put up with it. What is a bubble juice? Is glycerin useful at all? I am no chemist. But after my little foray into bubble juice making, it appears to me that David Stein’s Big Bubble Mix is basically J-Lube and baking powder. It clumps when mixed with water, as one would expect of J-Lube. It fizzles when added to water as one would expect of baking powder. It is five times more expensive to buy the mix than to buy J-Lube and baking powder yourself. But it is convenient if you are just getting started. And compared to commercial liquid bubble solutions, David’s mix is many times more economical. David said that his mix is not made of J-Lube and baking powder (see comment section below). I believe him. Detergent reduces surface tension, allowing bubbles to form. Adding more detergent causes bubble walls to become thinner. Wall thickness determines the color of bubble. Desirable thicknesses that generate the most colorful bubbles are found between 150nm-700nm. Consult this color chart. In general, more detergent yields thinner walls thus better colors, until the ratio hits the Critical Dilution past which one gets drastically diminishing returns. Baking Powder is used to neutralize the alkalinity of the detergent, and to keep the pH level at 7.4, resulting in thinner and stronger bubble walls which yield more colorful and longer-lasting bubbles. 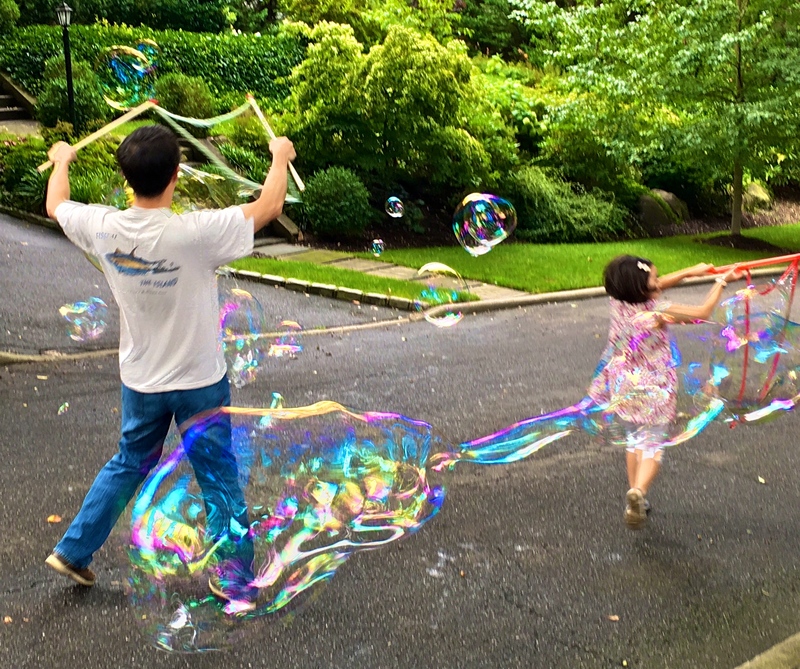 J-Lube and its active ingredient polyethylene oxide (PEO), in the right quantity, lend elasticity to the bubble juice, making it much easier to close giant bubbles. The elasticity allows bubbles to self-heal, meaning that large bubbles under stress split into smaller ones instead of bursting. Glycerin is not a key ingredient, as explained earlier… unless you want to squander money adding huge amounts of glycerin. When glycerin concentration is in the 10%-30% range (by weight w.r.t. the juice), it lends longevity and elasticity to bubbles. But the same effect can be achieved cheaply by applying a tiny amount of J-Lube. Glycerin is used here to mix J-Lube with water, without clumping. This entry was posted in Fun and tagged Big Bubbles, Bubble Wand, BubbleThing, Giant Bubbles. Bookmark the permalink. Would it be okay to use a few of your beautiful Bubble Thing photos on my #thebubblething Instagram page? I especially like the photo of the little girl blowing a really long one. Also, about my Bubble Thing BIG Bubble Mix (available at https://www.amazon.com/Bubble-Thing-BIG-Mix-GALLONS/dp/B004GJNKC6/ref=zg_bs_166028011_34?_encoding=UTF8&psc=1&refRID=XH36BRTXVXQQVZZFJ0A9), it is NOT made of J-Lube and baking powder. Also, it’s usable instantly, there’s no waiting overnight. Also, if you calculate the cost-per-gallon of bubble solution, you’ll see it’s by far the least costly of any bubbles on the market. About J-Lube, I wouldn’t recommend it to amateurs, and certainly not to kids. Unless you get the amount exactly right, it’s the most horrible mess you’ll ever see. Try it! Then try Bubble Thing BIG Bubble Mix, and you’ll really appreciate it. Peace. David, it’s an honor to have you comment on this page. I did buy your mix to get started. It was wonderful. Like I wrote, you are why I looked into this big bubble thing. It appeared to me like J-Lube and baking soda, after I tried to make the juice myself. Clearly I have very limited experience and input. That was just my observation. I’ll add your comment to my text. It is really *the only commercial bubble mix* in the market. I should make this more obvious to readers. Yeah. J-Lube needs to be used with precision. I know this first hand from making bubble juice. This is also why I linked to that “stringiness” video so people can understand this better. Hey, you can repost any of my pictures here. Some of these may have been bubbles made with your mix actually. I have a lot more pictures. I’ll get back to you if I process/edit them. I too feel honored by your kindly reply, and please stay in touch. We of the giant bubble global brotherhood must unite in our everlasting cosmic battle for giant bubble truth and size against the small bubble evil. Ich habe das Rezept ausprobiert leider war der erwünschte Erfolg nicht da. Leider bekam ich eine Schleimige Masse mit der es fast nicht möglich war Blasen zu bilden. Stimmt die Backpulver Menge 15ml = 15gr ist das nicht zu viel? I tried the recipe, unfortunately, the desired success was not there. Unfortunately, I got a slimy mass with which it was almost impossible to form bubbles. 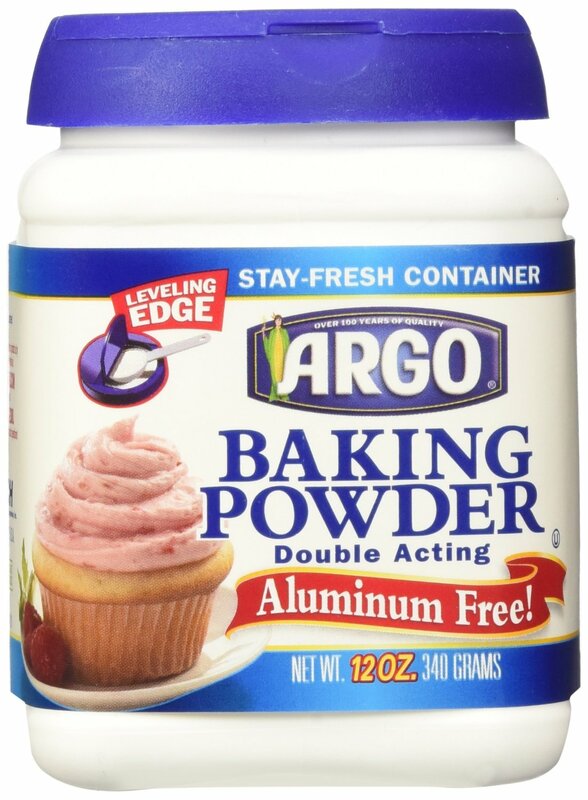 Is the baking powder 15ml = 15gr is that not too much? Hi. I am sorry it did not work for you. I confirm that the volume of baking powder and glycerine is the same. The amount of baking powder looks alarming, I know. The starch component also collects at the bottom of the bottle as the solution sits overnight. Some people pour out the solution carefully after a day, leaving the sediment behind. But I can tell you from experience that the sediment does not matter. I’ve tried both ways, with and without pouring the the clean solution out. Note that everyone says you need to let the solution stabilize overnight. I do that, except one time. The solution worked okayish used right away. But it was a hot and dry day, not the best condition. So I am not sure whether the unstable solution was to blame, or the weather. I think your problem is cause by too much J-Lube. If Google Translate is to be believed, you wrote that you got a “slimy mass”. If that is what you got, then very likely you used too much J-Lube. I referenced this YouTube video in the article to help folks understand why I used the amount I used. You can try the stringiness test shown in the video. Looking at water drops formed by too little and too much J-Lube helps you confirm that you used the right amount. Lastly, make sure you used 4L of water. Maybe you added too little water? If none of these were the cause, then can you be more specific about how it did not work? Were you not able to form a film when you open the sticks to create space between ropes? Were you not able to “close” a bubble? Do the bubbles pop shortly after you close them? Are there any liter and gram indications for these ingredients? That’s is a good point. I will add that tonight. 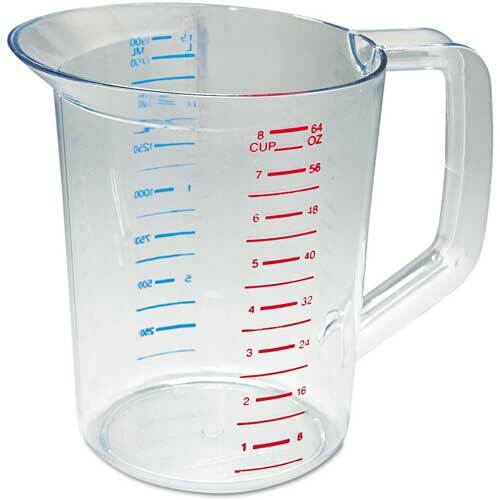 For now, you can search on google like this “1 cup in liters” to see conversion. Incredible colorful bubble displayed that I have never seen.